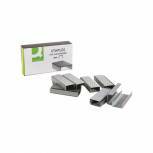 Q-Connect Staples 26/6mm (Pack of 5000) KF27001 Pack of 1 Q-Connect 26/6 Staples for strong and secure fastening. Fit with a variety of standard sized staplers. Ensures that pages stayed fastened. Designed not to jam in your stapler. Low cost, high value alternative to bigger brands. Metallic Finish. Rexel Choices Staples No. 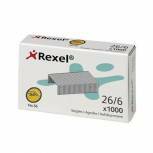 56 (Pack of 5000) 6025 Pack of 1 Rexel No.56 Staples. Precision engineered to the highest standards of quality and performance. No.56/6mm. 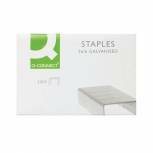 Q-Connect Staples 24/6mm (Pack of 1000) KF01278 Pack of 1 Q-Connect 24/6 Staples. Precision made staples engineered to the highest standards of quality to give excellent performance. Designed to fit all staplers using 24/6 staples. 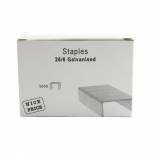 26/6mm Metal Staples (Pack of 5000) WX27001 Pack of 1 Staples for an affordable alternative to brands. Staples allow for easy fastening of documents. Work in your stapler without blockages. Prevents the loss of information. Quality construction is designed to last. Metallic Finish. Pack of 5000. 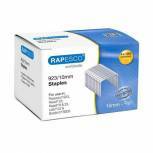 Rapesco 26/6mm Staples (Pack of 5000) S11662Z3 Pack of 1 Reliable Rapesco technology. Designed to be hard wearing. Boasts a high number of staples per box. Easy to use. Pack of 5000. Metallic finish. 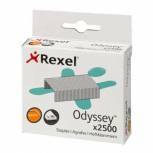 Rexel Odyssey Heavy Duty Staples (Pack of 2500) 2100050 Pack of 1 Precision-manufactured steel staples. Designed for Rexel Odyssey heavy duty staplers. Reliably fasten anything from 2 to 60 pages. Metallic finish. Pack of 2500. Rapesco 923/14mm Staples (Pack of 4000) S92314Z3 Pack of 1 To fit all heavy duty staplers taking 9 series and 23 series staples. Also fits Rexel Giant. Galvanised finish. Pack 4000. 14mm leg lengths. Rapesco 923/8mm Staples (Pack of 4000) S92308Z3 Pack of 1 To fit all heavy duty staplers taking 9 series and 23 series staples. Also fits Rexel Giant. Galvanised finish. Pack 4000. 8mm leg lengths. 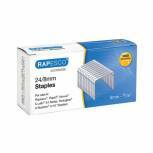 Rapesco 923/10mm Staples (Pack of 4000) S92310Z3 Pack of 1 To fit all heavy duty staplers taking 9 series and 23 series staples. Also fits Rexel Giant. Galvanised finish. Pack 4000. 10mm leg lengths. Rexel No. 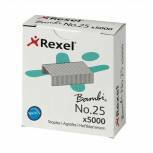 25 Staples (Pack of 5000) 05025 Pack of 1 Rexel staples are precision engineered to the highest standards of quality and performance. There's a Rexel staple to fit every stapler in the Rexel range. No.25(Bambi). Rexel Choices Staples No. 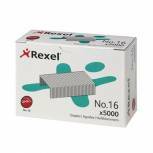 16 (Pack of 5000) 6010 Pack of 1 Rexel staples are precision engineered to the highest standards of quality and performance. There's a Rexel staple to fit every stapler in the Rexel range. No.16. (26/6 staples shown). 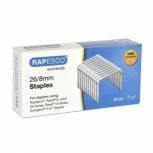 Rapesco 24/6mm Staples (Pack of 5000) S24602Z3 Pack of 1 Reliable Rapesco technology. Designed to be hard wearing. Boasts a high number of staples per box. Easy to use. Pack of 5000. Metallic finish. 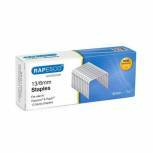 Rapesco 13/6mm Staples (Pack of 5000) S24602Z6 Pack of 1 Reliable Rapesco technology. Designed to be hard wearing. Boasts a high number of staples per box. Easy to use..
Rapesco 923/12mm Staples (Pack of 4000) S92312Z3 Pack of 1 To fit all heavy duty staplers taking 9 series and 23 series staples. Also fits Rexel Giant. Galvanised finish. Pack 4000. 12mm leg lengths. Rexel No. 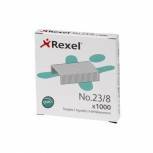 23 13mm Staples (Pack of 1000) 2101053 Pack of 1 Rexel No. 23 Staples (13mm leg length). Heavy Duty Staples compatible with Rexel Goliath, Gladiator and Apollo Staplers. (26/6 staples shown). Rexel No. 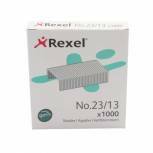 23 8mm Staples (Pack of 1000) 2101054 Pack of 1 Rexel heavy duty 23/8mm staples. Rexel No. 23 Staples guarantee accurate, trouble-free stapling and are recommended for selected Rexel Tackers and Heavy Duty Staplers. 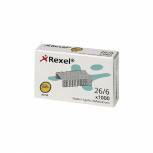 Rexel Staples No.56 6mm (Pack of 1000) 6131 Pack of 1 Rexel staples are precision engineered to the highest standards of quality and performance. There is a Rexel staple to fit every stapler in the Rexel range. No.56. 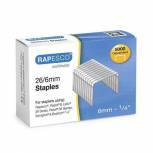 Rapesco 26/8mm Staples (Pack of 5000) S11880Z3 Pack of 1 Staples for secured document fastening. Suitable for use in a range of machines. Keep files properly organised and neat. Quality materials keep documents secure longer. 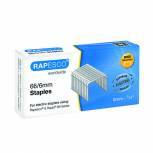 Pack of 5000..
Rapesco 24/8mm Staples (Pack of 5000) S24802Z3 Pack of 1 Staples for secured document fastening. Suitable for use in a range of machines. Keep files properly organised and neat. Quality materials keep documents secure longer. Perfect for all office and home usage. 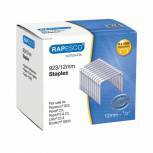 Rapesco 66/6mm Staples (Pack of 5000) S66600Z3 Pack of 1 Reliable Rapesco technology. Designed to be hard wearing. Suitable for all Rapesco Staplers. Easy to use..